The Lo Trau and Mayon Turbo stoves are related. The Mayon Turbo is an improvement by Reap Canada. The Lo-Trau rice hull cookers presently being distributed in Negros are relatively inexpensive (800 Philippine pesos) and have a low cost of fuel. Presently, rice mills in Negros pay workers to bag rice hull for subsequent disposal. These 10 kilogram (kg) sacs can be obtained free and transported for a mere 5 Philippine pesos. In some communities in the Kabankalan area, families are spending 200 Philippine pesos per month on firewood. In other cases, women are expected to walk more than a half day three times a week to collect firewood. This is due to the fact that the majority of land surrounding communities is agricultural, making the collection of fuelwood near the home difficult. Also, the uplands are now largely deforested. The Lo-Trau rice hull cooker is made of sheet metal and is lightweight (2.5kg). 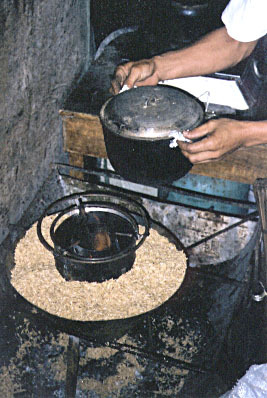 The user fills the stove’s main drum (1) with rice husk. The husk is ignited with a simple piece of paper, and an even burning process can then be regulated by the user. The main drum is topped off with husk when required. It consumes approximately 1.2  1.5 kg of husk per hour 1. The combustion process can be quenched at any time by removing the inner drum (2). Early demonstrations showed that there was a great deal of interest in the cookers due to the relatively easy ignition and rapid cooking times. 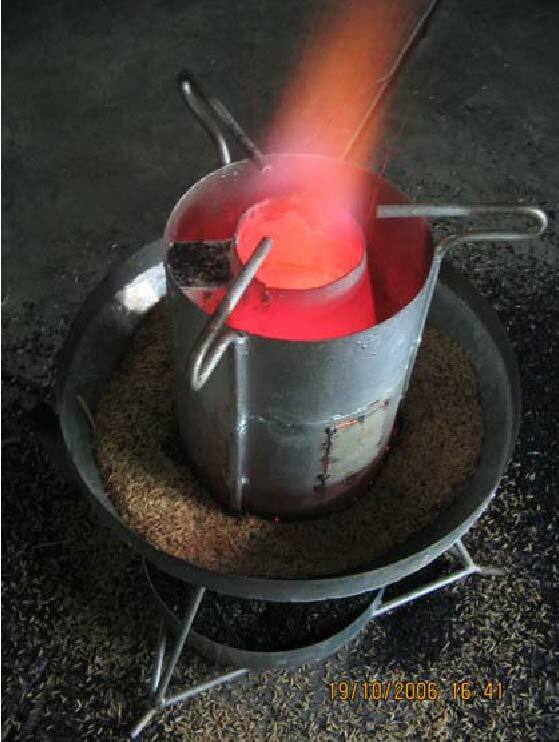 In situ test findings showed that it took only 5 minutes to boil water using an approximate 180g of rice husk. This figure is impressive when compared to liquefied petroleum gas (LPG), fuelwood, and charcoal stoves, which required 5, 15, and 20 minutes respectively to boil the same amount of water. It should also be noted that at the present time both wood and charcoal fires are frequently ignited using kerosene, a cost that would be eliminated with the rice husk stove. 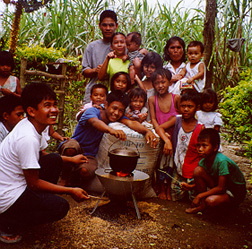 The most popular cooking fuel in the Philippines is clearly fuelwood, which is used by some 8 million households. Burning fuelwood within the home creates a great deal of smoke, which can lead to respiratory difficulties. The LO-TRAU stoves were found to burn cleanly, emitting very little smoke. The high quantity of ash associated with the burning of rice hull is recycled to the fields. Care should be taken in handling the ash, as prolonged exposure to the silica particulates can cause health problems associated with respiratory difficulties. 1 Information and basic design concept for the LO-TRAU stove taken from "Using LO-TRAU Rice Husk Stoves" compiled by Hieu Hien, Phan extracted from "The LO-TRAU", Van Nguu, Nguyen, July 1, 1992. Several sizes of cookers are available including the 6000, 7000 and 9000 models with 6 inch, 7 inch and 9 inch diameter fuelbeds respectively. Labor-saving equipment. 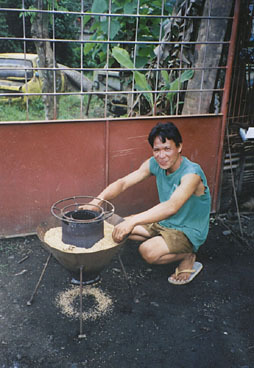 In 1993, a rice-hull stove contest was sponsored by the society of agricultural engineers in the Philippines. After the contest, four stoves were field tested in a village in Nueva Ecija. The models evaluated by the women cooperators were the IRRI stove, the Maligaya stove, the Ilongo stove (Central Philippine University, Iloilo), and the Vietnamese Lo Trau stove. The models were color coded to prevent women from knowing the origin of the stoves and to avoid biased choices. Women were allowed to use each model for a week, after which an evaluation interview was con-ducted. The evaluation used a point system and a comparative system. 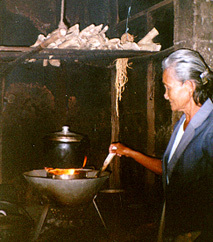 In the comparative system, the users were asked to compare the different stove models and rank them according to simplicity of design, durability, ease in loading rice hulls, ease in removing ashes, safety, suitability for all types of cooking, ease in transporting, fuel requirement, no ash contamination of food, and messiness and smokiness. 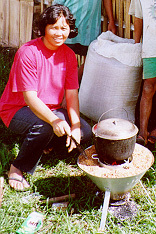 The women in the village preferred the Lo Trau stove followed by the Maligaya stove, the Ilongo stove, and the IRRI stove. 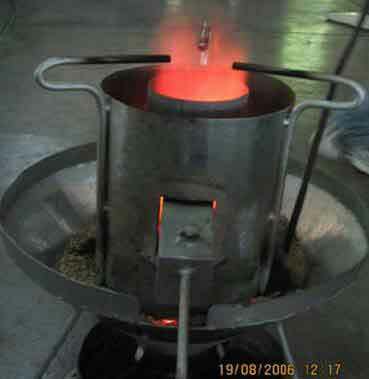 The IRRI stove was later modified and improved based on women’s feed-back. The stove test showed the importance of incorporating users’ feedback in designing, testing, and evaluating any equipment.